Last Day Free on Kindle. Mary’s Mountain, my novelette, is FREE on Kindle from October 26 until October 30–the week before a very important midterm election that will affect our American values for better, or WORSE. It’s a short read, so I hope you’ll take me up on my offer. Just click on the book cover. Mary’s Mountain is a story about Tolerance taken to the extreme. It is Paul Dunaway’s struggle to re-shape his affluent but joyless life, as the opposing forces in an out-of-control, politically correct America–that he helped to create–now, threaten to take him down. A description of the infamous Institute of Tolerance found in the novelette: Today, inside its progenies, rigid rooms are covered in fiddle-faddle flowers and sentimental hearts beating warm and fuzzy pizazz into nearly every state of the union. Outside each building, a neon sign blinks: Tolerance Today, Tolerance Tomorrow, Tolerance Forever! The signs have fingers, virtual reality, to motion the people inside. The signs move. The lights move. And the people inside are moved, to tolerate anything. Mary’s Mountain is somewhat futuristic, but not entirely. Already, there is an attempt to revise our history, and we accept it. Already, Truth is being debunked, and we swallow it–especially if what is replacing Truth agrees with our personal opinions, or tickles our indulgences. Already, our religious faith and American values are being challenged. Already, our right to hear the truth on television and social media is being meddled with. Already, our country’s enemies are at our throat, and yes, crossing our border. And some of them actually mean us great harm. This is dangerous! Why don’t we fight back against any of this? Many of us don’t want to be labeled intolerant. Except intolerance has nothing to do with keeping our country safe. Keeping our country safe is called plain Common Sense. Many of us have become tolerant cowards, we have become tolerant of coarseness, we have become tolerant of laziness, we have become so tolerant that whenever we are fed lies by social media, the entertainment industry, and the fake news, we gobble it all up like a favorite dessert. We are supposed to be flesh and blood human beings, on the lookout for ourselves and others; but instead we’re becoming sponges, soggy with wrong information– when what we need to be are heroes. And one vote–one thoughtful vote, stemming from what America was founded to be–can make each one of us a hero. We once considered wrong as actions against the commandments of God. Now many of those wrongs have been propagandized to seem right. In other words, we are being asked by far left progressive liberals to tolerate the intolerable. And worse, we’d better put up with it, or else be called deplorables, bigots, racists, or religious zealots; all, while they twist the United States Constitution until it is unrecognizable, and then cut down our American roots, fought for long and hard by our ancestors. “The tree rotted from within,” he said, catching the attention of a few others still chewing the goodies. “At first, there was no outward sign of its decay. It appeared unusually beautiful and produced an abundance of delicious fruit, so much that the people lay in its shade, stuffing themselves. Still, there were some who knew the tree was decomposing, yet did nothing to heal it.” Paul intended to follow with the truth about himself, but a young priest at the table spoke up first. We can no longer afford to do nothing. Our positive vote matters!! What is honest tolerance anyway? And what is intolerance? Kaye Park Hinckley’s novella “Mary’s Mountain” was so captivating that I read it in one sitting without putting the book down once. It has apocalyptic flavors, much like the “1982” or “Brave New World” or “Animal Farm” type stories from decades prior. But the novelty of Hinckley’s tale is refreshing, because she portrays a society that embraces liberalism in such a way that traditionalists are ostracized and even banned. She foretells what our nation could look like politically, socially, and morally in a frighteningly and chillingly realistic portrayal of how technology plays into the degradation of an entire generation. Hinckley is a fantastic writer who uses vivid imagery through the written word for character and plot development. I was duly impressed with the power of this story in such a short novella. Brilliantly done!–Jeannie Ewing, author of Waiting With Purpose. And from a recent reader of Mary’s Mountain: Tolerance – I will never look at the word in the same way again. Kaye, I don’t know where to start in telling you how I am affected by your book. So for the time being, just let me say thank you, while I gather and reflect on what I have learned from you through Mary’s Mountain. Thank you for writing it. I’ll be in touch again. The question in Mary’s Mountain, is whether Paul Dunaway–someone like you and me– will continue to indulge in his so-called broad-mindedness, or return to his honest convictions, enough to become a white-knight for America. I hope you’ll read Mary’s Mountain as a warning–BEFORE the midterm election, while this book–and we as Americans–are still FREE. For quite some time this country has needed a turn back to the values upon which it was founded. Is this the time? Only a few weeks ago, a good man, Justice Brett Kavanaugh, courageously stood up to defend his name, his honor, his family, from despicable lies proffered by some power-hungry politicians and their followers. But is today a time to castaway that dishonest, power-hungry attitude and remove the face of hypocrisy? Yes!!! This is America’s time to rise after decades of condoning behaviors that have weakened us as a nation, and as the human beings we were created to be. Pray for THOSE WHO VOTE in the upcoming election, that they may let go of themselves and think of America and her people instead. I for one am sick of their violent ‘in-your-face’ lack of civility and complete abandonment of common sense! For certain, this IS the appointed time to turn. a time of war, and a time of peace.What advantage has the worker from his toil? for the sons of men to be busied about. THE GHOSTS OF FAITHFUL — NOW IN BOOKSTORES!!! IZZY COLLIER, DO YOU REALLY SEE GHOSTS? Faithful suggests a broad canvas–a well-rendered local; a promising war of equals in the characters, a clear desire to address/tackle the issues larger than the back and forth, and a clear understanding on the author’s part about pacing and clarity. Also, I thought the father’s chapter was really funny! SEE THE CHARACTERS and MORE, as well as Promos from three other books! Real Ugliness Inside the Democratic Party??? Sometimes we’re concerned only about appearances; the outside of things. We stuff closets with things we don’t want any visitor to see. We cover our faces with make-up, and our bodies with just the right clothes to make a favorable impression. We say all the things people want to hear whether we believe in them or not. We all do this to some extent. On the surface it may be harmless–unless we are covering-up–and yes, hiding– an ugliness going on inside us. When we are concerned only with what others think about us, we have no principles. When we say one thing in daylight when everyone is watching, but do another thing in the dark when no one sees us, then we are hypocritical, self-serving, and false human beings who should not be trusted. Isn’t this what we despise about politicians? Their dishonesty. Their hypocrisy. Their self-grabbing. Politicians polish up the outside of themselves so that they appear to care for the downtrodden, when the downtrodden are only a means to votes. We see this today, as far as I’m concerned, in the Democratic Party where nothing is too sacred to use for their own gain. Those on the far left of this part are crusted over with hatred, incivility, and an actual call for violence against those they disagree with. They are completely self-serving, without regard for our country. Where are those principled stops that ought to be there? There are times when any of us may consider an action that is completely self-serving, BUT we don’t, because some life-principle we believe in, stops us. However, there seems to be no life-principle to stop the self-aggrandizement of the left-wingers in this party. No lies they will not tell, no people they will not use, no person they would go out of their way to honestly help. For thirty years, they were in a position to actually help, the people who voted for them, who depended on them–however the country did not fare better when they were in power, but worse. Today, our country is finally making gains–big gains of respect which had been so lacking throughout the world, gains in our pocketbooks due to jobs in a booming economy, and a burgeoning strength for Americans of all races–not pitting one race against the other, or one gender against the other to get votes. In the upcoming election, we the people–all the people, have the ability to keep moving forward. Don’t let the left-wingers destroy our progress. Inside each of us, is the potentiality to do right, or to do wrong. By our life principles we choose the path for one or the other. And before doing so, we make must make judgments, especially when we VOTE. I must judge the left-wingers in this party. As an American Citizen and VOTER, I must ask: where are their principles? Where would their path take America?? I suggest it is not the right path. I suggest that time and time again it has been the wrong path of plunder, self-indulgence, and complete hypocrisy. I watched the unbelievable nastiness of their lies in the Kavanaugh confirmation, as I’m sure you did. The lengths they would go to in order to get their way was abominable! I cannot VOTE for anyone in such a political party. Can You? Need to Re-Shape the Pie??? My mother was not a pie-maker in the physical sense. But in the sense that she could usually find a way to get through any crisis, she was a top-notch re-shaper of pies. Most of us have our unique ways of ‘getting through’ undesirable times in our lives when sadness seems overwhelming. We cannot change a sad situation, but we can try to motivate ourselves out of it. We have the ability to decide to climb out of the dark hole we find ourselves in. Some of us look back and choose to appreciate the people and things we still have, and that brings solace. Others look ahead and choose to begin again, to dream and plan for better events to come. Getting through a bad situation begins with a vision of improvement. Because, without a vision, we remain static. But for those who do nothing except bathe in their misery, better times will come more slowly, if at all. In reality, many of us make a decision to give-up and remain the victim of circumstances. Maybe these are circumstances that we have brought on ourselves through our own pride, greed, envy, lust, vengeance, laziness, or anger. We let one or more of these vices control us, forgetting the God-given gifts we have to overcome them. Or maybe an awful life event happened that was not caused by us at all, yet we must deal with it. Well, we cannot give-up. We are not made to give-up. No, it is not easy to move ahead. Yes, it may take time. But we are children of God with His gift of imagination, His gift of an ability to think and plan, love and forgive–even to forgive ourselves. We are wonderfully created human beings who can re-shape ourselves, just as a pie-maker reshapes a pile of sticky dough, and makes it into something desirable, something we can smile about and, again, be proud of. Having a Hard Time Trusting?? When we consider the rottenness in both our government and our church, or when we feel at a loss in our personal lives, or when others have betrayed or hurt us, or we are worried about our families, our jobs, our health, it is important to remember to put our Trust in God, and allow Him to lead us. Some years back, when I taught Religion to Catholic teenagers, I was responsible for a group trip to Ave Maria Grotto in Cullman, Alabama. 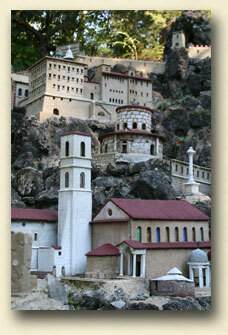 Known throughout the world as “Jerusalem in Miniature,” the Grotto is a beautifully landscaped, four-acre park designed to provide a natural setting for the 125 miniature reproductions of some of the most famous historic buildings and shrines of the world. The masterpieces of stone and concrete are the lifetime work of Brother Joseph Zoettl, a Benedictine monk of St. Bernard Abbey. Begun as a hobby, with various materials he could find, and infinite patience and a remarkable sense of symmetry and proportion, Brother Joseph re-created some of the greatest edifices of all time. Before the teens and I visited the Grotto, we took a trip about TRUST through the nearby woods. The idea from the trip into the woods came from a prayer–one of my favorite prayers–by Thomas Merton, an American Catholic writer, mystic, and Trappist monk of the Abbey of Gethsemani, Kentucky. On that trip the teenagers, another teacher and myself, divided into pairs. One person in each pair took a turn wearing a blindfold while the other person led him or her through the trees, over stones, across a stream. The one in blindfold had to trust completely in the other to give him verbal instructions to keep from bumping into a tree, tripping on a stone, or falling into the winding stream. Then the partners changed places, with the other putting on the blindfold. I will never forget the trust I had to put into the other teacher–because I’m a control freak and to be walking blind was something I don’t like to do. But this is what we have to do–especially today. God IS in charge.